More precise at the same affordable price. Scotchman Industries® is thrilled to announce Scotchman’s latest and greatest 50-ton hydraulic ironworker. The NEW 5014-ET has taken the 5014-TM, 3-station turret model to a whole new level. The new 50-ton ironworker now comes standard with a new, improved electric stroke control which makes this machine more precise than ever. Upgrading this new 5014-ET ironworker to a fully electric stroke control increases its accuracy and reduces the mechanical linkage which extends the life of the machine. Bending parts on a Scotchman 50-ton is now as accurate as any other ironworker in the industry; and is backed by Scotchman’s Best-in-the-Business warranty. The 5014 ET is proudly made in America, with many standard features and equipment including: an angle shear that will shear up to 4″ x 4″ x 3/8″ angle iron and a flat bar shear that can shear 3/4″ x 4″ to 1/4″ x 14″. Now, the new electric stroke control with remote foot pedal and punch slug receptacle are standard features at the same affordable price as the 5014-TM model. This machine also features a rectangle notcher that will notch up to 2-1/2″ x 3″ in 5/16″ material. With its component tool table design, it has the ability to accept optional equipment, such as the 12″ press brake, rod shear, square tube shear, picket tools, pipe notcher, and special tooling, which is also available. Scotchman offers a complete line of American-made ironworkers ranging from 45 to 150 tons of hydraulic pressure–quality, power, & versatility you can count on! 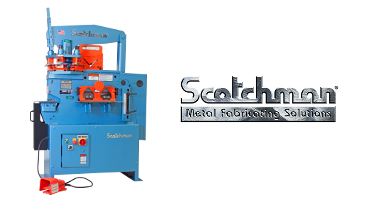 Scotchman Industries, Inc. is a leading producer of metal fabricating equipment, accessories and custom tools. Known to be the solution preferred by metal fabricators, Scotchman is proud to offer excellent quality American-made & European import products, as well as provide dedicated customer service. A Best-in-the-Business Warranty comes standard. Leasing is available for qualifying customers. Visit www.scotchman.com, info@scotchman.com, or call TOLL FREE at 1-800-843-8844 or DIRECT at 1-605-859-2542 to learn more about products, request a free catalog or schedule an on-site demonstration.